Budgets are moral documents. What our government spends our money on, and how it raises that money, demonstrates our values. The federal budget has a big impact on the lives of Americans. On the one hand, the federal government provides employment, education services, and access to health care. On the other hand, the federal government invests heavily in policing, incarceration, and other control tactics that threaten United States families and communities, as well as policies that result in concentrated wealth rather than shared prosperity. On balance, it is clear that the federal budget’s overall impact in United States is not consistent with our broadly shared values of fairness and opportunity. 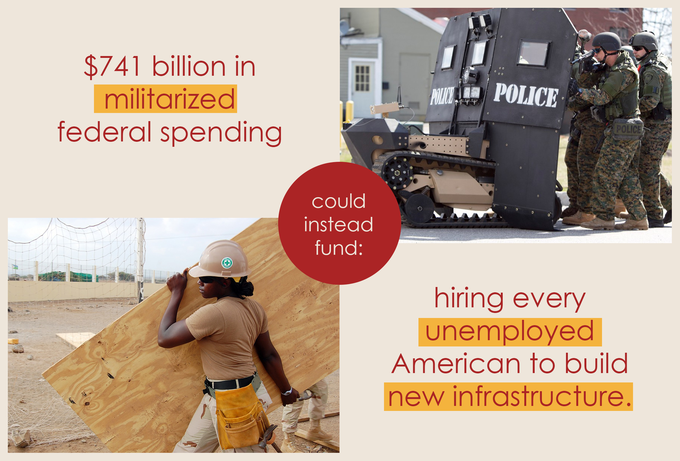 It is time for a blueprint for reinvestment: away from militarized tactics that weaken communities, specifically targeting Black and Brown communities, and toward human development that unlocks opportunities where they are most needed. Together with the Center for Community Change, we have developed fact sheets for 13 states, plus the District of Columbia, highlighting how reinvesting away from a militarized federal budget could bring positive impacts for families and communities through greater investment in job creation, education, health care, housing and more.